I commend the police for their cooperation in bringing justice to the tortured women’s family. Even though it took plenty of persuasion from Human Rights Activists and the media to arrive at this news today. However, there is light at the end of the tunnel at last and we thank God. If you missed the story, you can read and watch the video HERE. The woman in the middle is the iyaloja(Ejigbo market woman leader), not sure what her role was in the torture……. 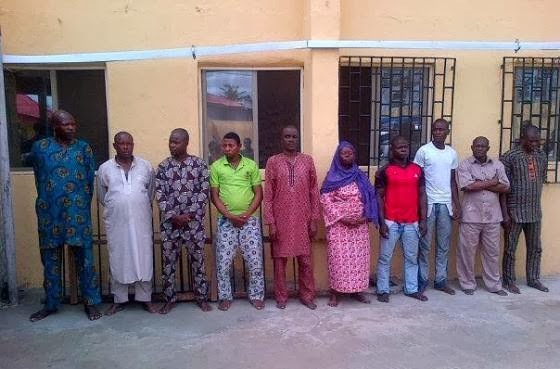 The Nigeria Police Force has arrested and will soon charge to court twelve (12) suspects connected with the torture of three women at Oba Morufu International Market, Ejigbo, Lagos. extorted the sum of fifty thousand naira from the father of the victims in return for their freedom. One of the victims, Juliana Agoma, a national of Republic of Benin, was moved back to Cotonou by her father where she subsequently died allegedly from injuries sustained in the torture. The suspects include; Isiaka Waidi (the Baba-Oja of the market) said to be the mastermind of the dastardly act which culminated in the arrest, debasement, torture and extortion of fifty thousand naira. Haruna Abdullahi and Buhari Yusuf who mixed the concoction of pepper and alcoholic spirit that were applied on the bodies, including the privates of the victims. Others include: Saheed Adisa, Lateef Tijani, Ahmed Adisa, Oloruntoyin Dauda a.k.a Iya-Oja, Adenkule Adenuga, Jimoh Busari and Azeez Akinosun. The Police have also declared wanted the following suspects, Tiri, an alleged member of OPC who was captured in the video footage and alleged to have stripped naked one of the victims, Ajoke Agoma, mother of the two other female victims in the presence of her husband. Otepa Oluronti, Akeem and Machael Abolore whose whereabouts are yet unknown but who have been implicated in having played active roles in the heinous crimes against the victims. Meanwhile, the IGP has commended the Human Rights, Civil Society, and Women Support Groups as well as the Office of the Public Defender, Lagos State Ministry of Justice and all other stakeholders whose important contributions have tremendously assisted the Police in this and other matters relating to human dignity, safety and security. He however calls on the general public to assist the Police with information that will lead to the arrest of the fleeing suspects. This entry was posted in General Emotions for singles, dating, married, Divorced, News, Relationships and tagged Ejigbo pepper sellers torturers arrested, Update on Ejigbo pepper sellers.